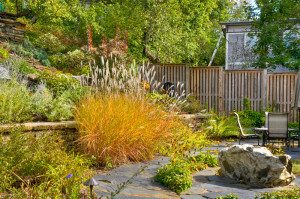 Does your autumn garden finish with a beautiful glorious bang, or does it just fade away with a whimper? Not at all!! The exuberance of mid-summer may be past but, in its own way, the garden in autumn is every bit as lovely. The summer stalwarts—Shasta daisies, Echinacea and the like—are surely past their prime. But Rudbeckia and Sedums, Anemones and Asters are just now coming into their own. Of course it is that way all through the year… as early flowers fade others claim the spotlight. Flowers are like actors, waiting for their cues to take center stage and bask in a few weeks of glory. 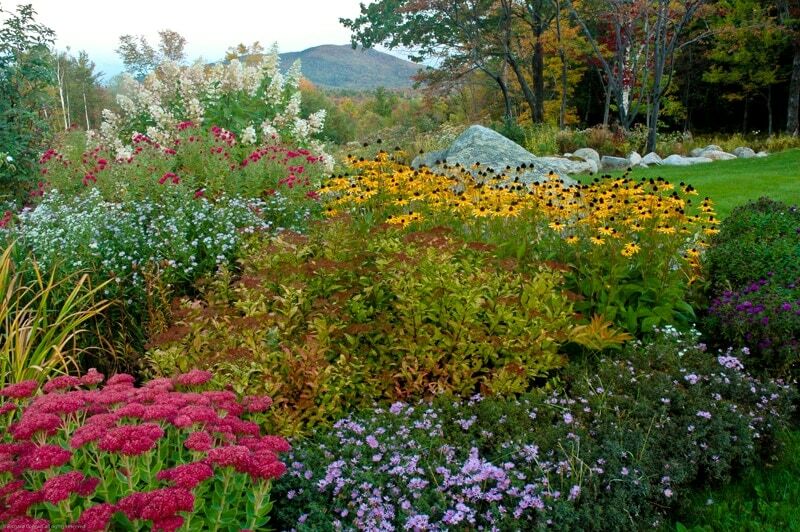 Some perennials bloom so late in the fall that the time remaining for them to get fertilized and set seed before the onset of cold weather seems impossibly short! But even in early October our asters are abuzz with late season bees, so clearly pollination is happening!! 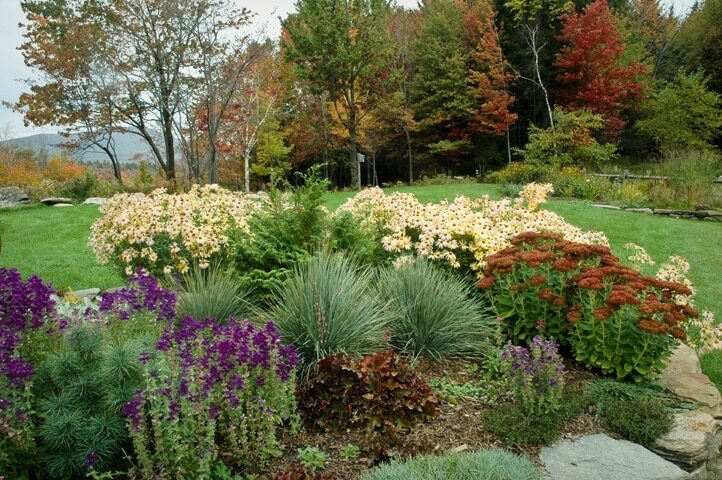 As in the wider landscape, the magical colors of fall —from purple and bronze to yellow, red and gold, play out in our gardens. 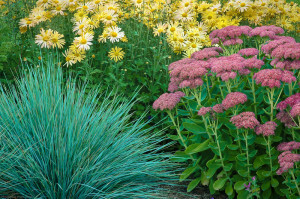 And our fall gardening palette includes not only a collection of easily grown perennials, but also colorful shrubs and beautiful grasses. And they harmonize together perfectly to complete the gardening season with a flourish. 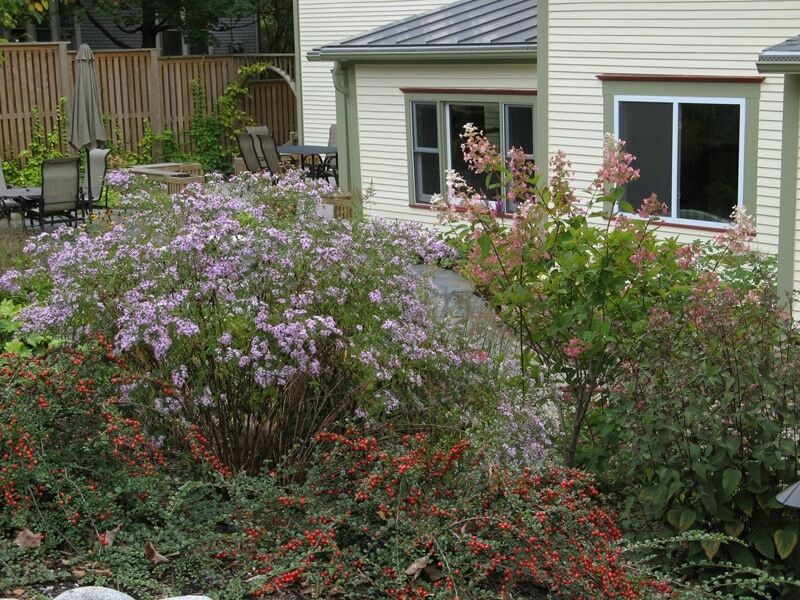 My purple-leaved shrubs include the Smokebush Cotinus ‘Grace’ and its cousin C. ‘Royal Velvet’, the Purpleleaved Sandcherry Prunus cistensa and the Elderberry Sambucus nigra ‘Blacklace’, and throughout the season they contribute to the overall garden tapestry. 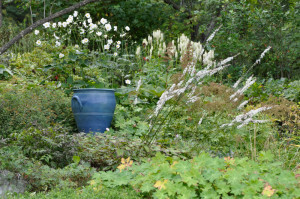 But in the fall, when mixed with Japanese anemones and other mellow-hued perennials, these backbone shrubs will truly shine. 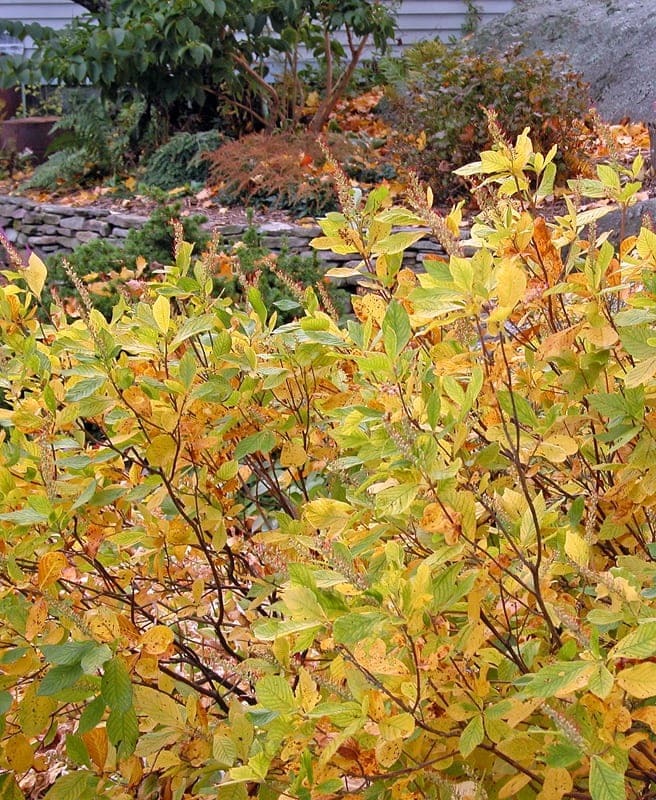 And, for an additional autumn splash—and an excellent substitute for the invasive burning bush— plant a group of medium height blueberry bushes. In the summer they give you fruit and in October they turn a beautiful bronze. 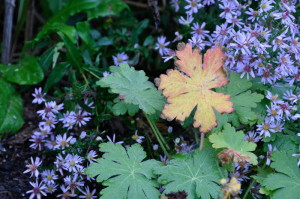 Combine them with the lilac-purple Geranium Rozanne, for a beautiful autumn picture. 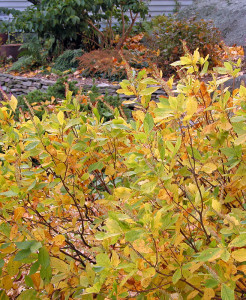 Spirea ‘Goldflame’, an attractive reddish-gold mound all season long, is another mainstay shrub for my garden. But when surrounded by Black-eyed Susans and purple asters in the fall it comes into its own. However in October the prize for the best of the yellows surely goes to Clethra, and its light-textured leaves show off especially well against a mounding dark evergreen such as Picea abies ‘Pumila’ . 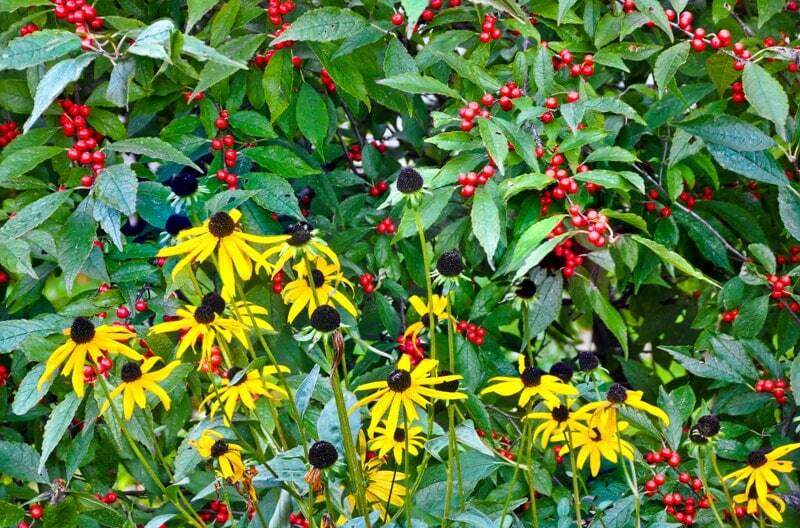 Cultivars of our native Winterberry, Ilex verticillata, offer some of the brightest red berries, and these too pair up well with black-eyed Susans. From mid-summer onwards ornamental grasses are major part of our gardens, and they all look good when paired up with compatibly sized perennials. 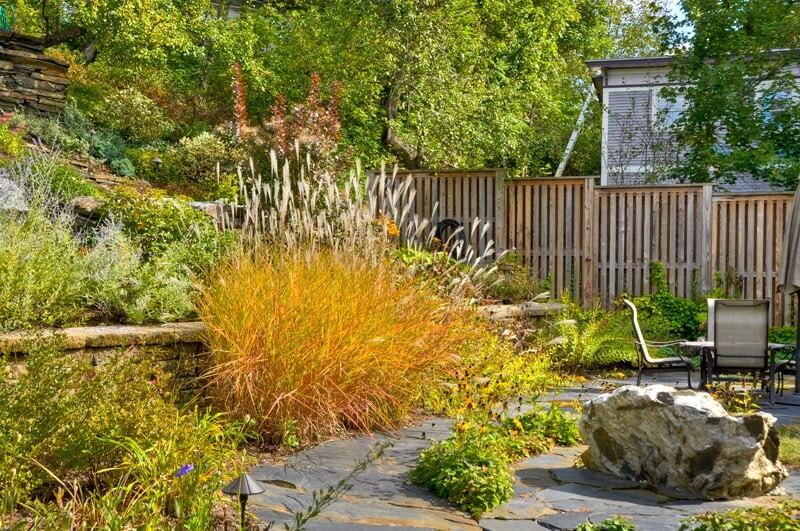 There are however two grasses in particular that are worth seeking out for their wonderful vibrant end-of-season colors: Maiden Grass, Miscanthus ‘Purpurascens’ with orange and yellow striations, and the Switch grass, Panicum virgatum ‘Shenandoah’ where a deep bronze color gradually subsumes its blue leaves. And finally, in a Zone 5 or warmer garden, I would find a spot for the Dwarf Fountain Grass Pennisteum alopecuroides ‘Hamlen’ with its graceful nodding flower tassels which from August onwards would make a great companion for Geranium ‘Rozanne’. There are plenty of easily grown perennials to round out the gardening season. They are mostly well-known and hassle-free, but their lack of exclusivity is no reason to eliminate them from our gardens. 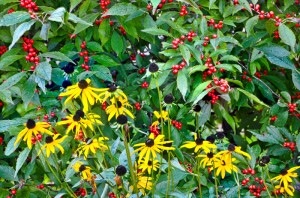 Everyone is familiar with Black Eyed Susans, Rudbeckia fulgida, and, like everyone else, I have plenty in my garden. Back in 1994 during our move to Vermont, I carefully relocated a couple of plants of the cultivar Goldsturm that I had purchased in 1990 from White Flower Farms. Now, as testament to their longevity, those two plants have transformed themselves into eye-catching pools of gold. 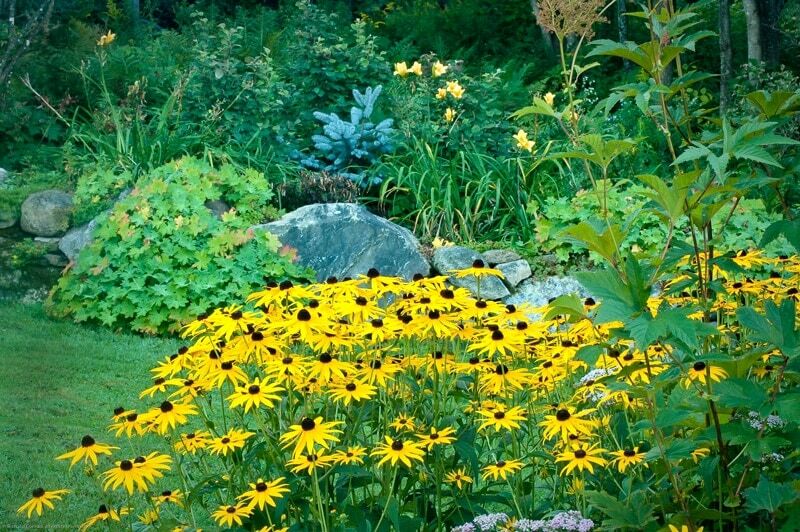 In addition Black-eyed Susans are pest-free and flourish in both sun and part-shade. What more could one ask? From a design perspective their strong color is a bit brash by itself. But pair them up with plants of contrasting texture and color, such as blue-tinted evergreens, frothy lavender asters, or the creamy flowers of Hydrangea paniculata ‘Tardiva’. I also love the six foot high Rudbeckia ‘Herbstronne’. This is one big plant that makes a bold statement, but it is well behaved in the border so, even in the smallest garden, there is probably a place for it. 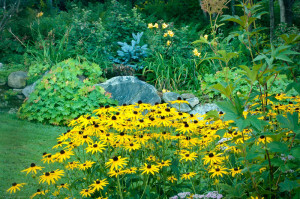 Try to resist the temptation to cut back either rudbeckia during the late fall clean-up. Leave them standing until spring—their skeletons will look lovely against the snow as their seed-heads provide winter food for the chickadees and goldfinch (who, miraculously, remain with us even the coldest of winters). Japanese anemones, which thrive in partial shade, have an endearing way of weaving themselves among shrubs, and occasionally popping up in unexpected places. Their small flowers dance on slender three foot stems. 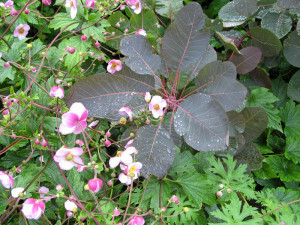 Most varieties have soft pink flowers which contrast perfectly with a purple smokebush: either Cotinus‘ Grace’ (dusky purple) or the Cotinus ‘Royal Purple” (reddish purple). There is also e pure white hybrid —A. Honorine ‘Jobert’– that makes a real statement next to the large blue pot on our barn slope. Initially a stand of Canadian Burnet (Sanguisorba canadensis) grew nearby. It has delightful cream colored bottle-brush flowers and blooms at the same time. But, against the pure white anemones, the cream of the Canadian Burnet appeared positively dowdy. So the Canadian Burnet was relocated near the pond where it will thrive with the added moisture.. And in its place on the barn slope I planted some pink Japanese Burnet Sanguisorba menziesii. It’s that old garden game of ‘musical chairs’… a little editing to get the best effect. The tried-and-true Sedum ‘Autumn Joy’ is a delightful plant, and every garden could surely use some. 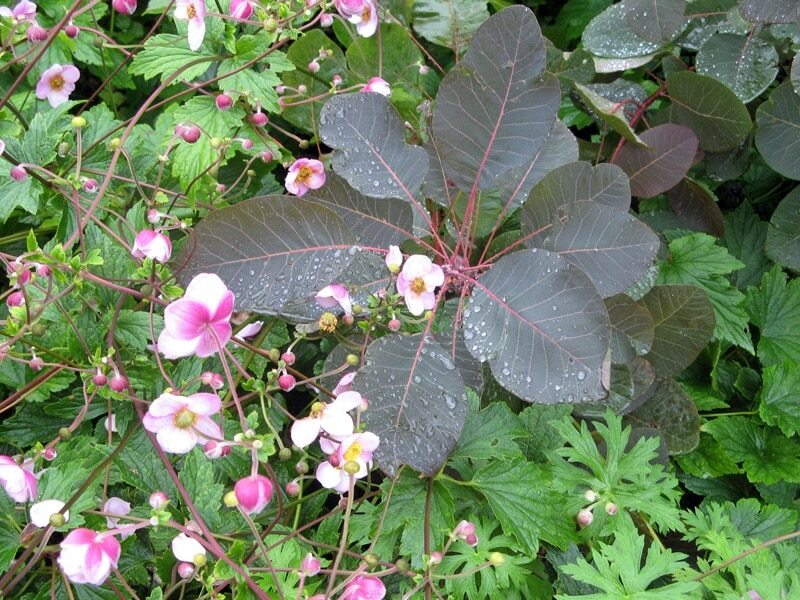 Its fleshy leaves contrast with summer perennials, and by autumn its flat rosy-pink flower heads, which eventually morph to bronze, are a real standout. For more mellower hues try Sedum ‘Matrona’. And in the winter their spent flower-heads look especially charming when topped with little snow hats. Some of the smaller sedums also flower in the fall. I particularly like Sedum cauticola, with its gray leaves and striking crimson pink flowers. A good sized patch looks splendid in front of a stand of Salvia horminium (see below). When asters put on their show it surely is a signal that the season is coming to a end. Aster are a huge genus of fall-flowering species from across the globe. In fact all our ‘New World’ Asters are currently being reclassified into a different genus called Symphyotrichum. This is a horrible mouthful so, for the time being at least, most people are still calling them Asters! I love the wild native asters that grow around here, in open fields, in swampy areas, and even in the woods. They come in colors of white, lilac and lavender, with names such as Heart-leaved Aster, Flat-topped Aster and Purple-stemmed Aster. At lower altitudes, even from the windows of your car, you can spot the well-known New England Aster, with its larger, deep purple flowers, growing along at the side of the road. However many of thesenative asters run by underground rhizomes and also quickly self-seed, which makes them less than satisfactory as garden plants. However the two cultivars of the drought-tolerant Aster oblongifolius —‘October Skies’ and ‘Raydon’s Favorite’— seem to be clump-forming. And, starting in mid-September, they are a delicate froth of either violet-blue or lavender-blue, and an excellent foil for the brightness of the Black-eyed Susans. They have decidedly ugly legs which need a careful camouflage. All-too-often their October flowers are killed by an early frost. However the two cultivars ‘Purple Dome’, and ‘Wood’s Purple’ (actually a New York Aster) are more compact and flower earlier, and continue to earn a place in my garden. 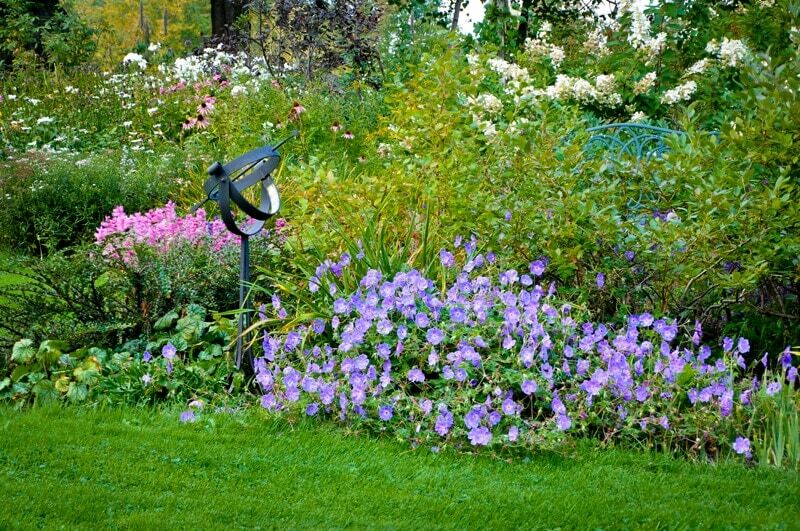 Rozanne is not just any old geranium: she is one amazing gardening miracle! 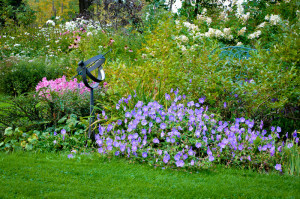 We usually think of geraniums as early summer flowers, and very useful plants they are for that. But Rozanne is unique among geraniums. In my garden she only really gets going in July… but once started she will flower non-stop until cut down in mid-October by a really heavy frost. She also keeps spreading outwards, so by the time September comes, a single plant is making quite a statement. Rozanne has an interesting history. About 20 years ago Donald and Rozanne Waterer noticed some interesting and long-flowering geraniums in their garden in Somerset, England. From these plants, Alan Bloom, owner of ‘Blooms of Bressingham, developed the patented Rozanne hybrid via tissue culture, and introduced her to the plant world in 2000. Listed as only hardy to Zone 5, I was skeptical that I could grow Rozanne successfully. But I acquired three plants which have all come through multiple winters. And despite a really cold snap in January 2011 (when the temperature here dropped to -25℉) my plants did even better the following summer. But then again, that may have been because they were so well protected under an excellent snow-cover that year. Anyway I am delighted to have this violet-blue flowered geranium gracing my garden each fall. Chrysanthemums help our gardens finish the year in style. But most of the so-called ‘hardy mums’ …especially the double-flowered types that show up at the garden center in the fall…are unlikely winter over in colder climates. But there are several single ‘daisy types’ of chrysanthemums that are truly perennial in my Zone 4A garden. The Chrysanthemum ‘Clara Curtis’, with rosy-pink flowers and yellow centers, blooms first. She is quite pretty and very easy to grow, but the stems tend to flop. Every fall I tell myself that, come next spring, I will create an elegant bamboo frame to support the growing stems…. but that has yet to happen. The second truly hardy ‘mum’ I grow is Chrysanthemum ‘Mary Stoker’, with pretty buttery-yellow flowers and stems that remain perfectly upright, even in winter. While Mary Stoker waits until in mid-September before coming into flower, she will still be gracing the garden even through the early frosts. And she looks great when paired up with Sedum ‘Autumn Joy’. Visitors to my autumn garden are invariably drawn to colorful Salvia horminium, which blooms from July and only felled by a really heavy frost. People are usually surprised when I tell them is an annual, since annual salvias are associated with a fire-engine red. 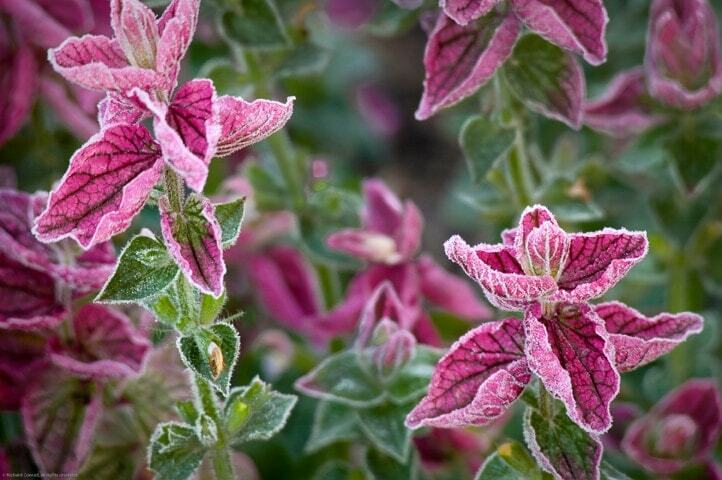 But Salvia horminium has purple, pink or white bracts with a hint of gray or green veining. 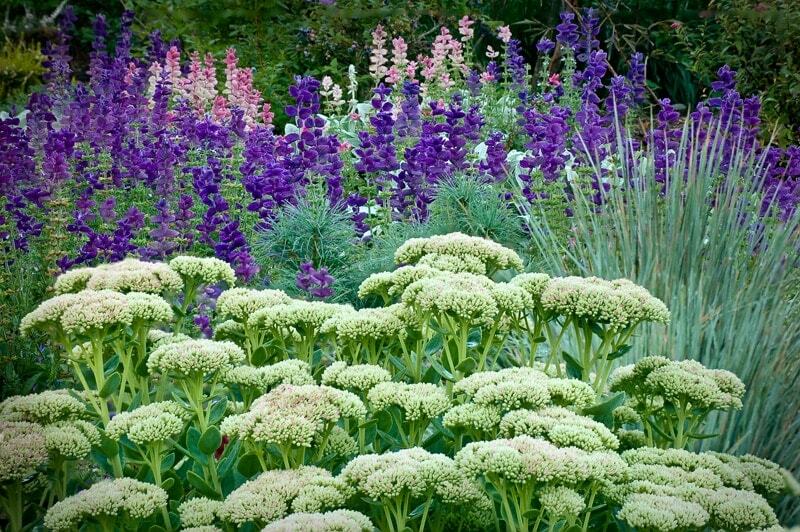 As they are fairly easy to grow from seed I usually start some in early spring using the Marble Arch mix. But they often self-seed in the garden and providing I am not too careless with my spring weeding, some plants will re-appear next season, thus behaving almost like a perennial! By mid-October my garden has that late-fall look…the blueberry bushes are bronze and the clethra is yellow, seed-heads are forming on the sweet autumn clematis, and the skeletons of the ornamental grasses dance in the wind. But, even after a couple of light frosts, ‘October Skies’ asters, Salvia horminium, ‘Rozanne’ geranium and ‘Mary Stoker’ chrysanthemum are still flowering like there is no tomorrow. Indeed fall is a special yet fleeting time, which is reason enough to savor each day.